The problem with too much water? Soggy soil and endless legal complications. This story was reported and produced by H20 Radio. Glen Fritzler lives about a mile from where he was born. Following in his parents’ footsteps he farms land about 40 miles northeast of Denver. In the past he has raised sweet corn, onions, and carrots. These vegetable crops have a high value to farmers as well as to consumers along the Front Range, but these days Fritzler is having trouble growing any of them. High groundwater is making his fields soggy. When the water recedes, it leaves behind a salty residue. Once there is too much salinity in the soil, many crops won’t grow, and it can take years for a field to return to productivity. As if the high groundwater wreaking havoc in his fields weren’t trouble enough, the water is also infiltrating Fritzler’s home. Water is seeping into his basement and cracking his foundation. He’s redone his basement twice, installing a network of drains and pumps at a cost of $50,000 to remedy the problem in 2010, only then to have to spend an additional $30,000 a year later just to keep the high groundwater at bay. Once, when he and his family were out of town, the pumps failed, and they came home to a house smelling of mold and mildew. Fritzler said his wife was ready to divorce him. But lately he might welcome some boredom and predictability. And that would mean ending the high-water hell he’s been living with. One simple solution would be to pump his wells and put the excess water in places where there isn’t enough. But pumping groundwater was drastically curtailed in his area by the state engineer about 10 years ago because of litigation by downstream users who claimed they weren’t getting their legal appropriation. Those water users are senior to well owners like Fritzler, so they must get their allotment first, in a specific amount, and at a specific time. That’s Colorado water law, known as the “prior appropriation doctrine,” and it’s enshrined in the state’s constitution. If Fritzler and other affected farmers want to pump their wells when their surface supplies run out, they need to get permission from the state’s water court. It’s a strange position for a farmer to be in, to be drowning in water that he can’t touch, even in times of drought. Another irony: if there hadn’t been farmers irrigating their fields, the alluvial aquifer under the South Platte may never have grown to the size it is. Not all of the water put on a field is consumed by the plants or evaporates—much of it seeps underground—and in this case adds to the rising water table. The town of Gilcrest, Colorado, has had to spend more than $1.3 million to repair its wastewater treatment facility, which was damaged by high groundwater. The high groundwater is affecting not just farmers. 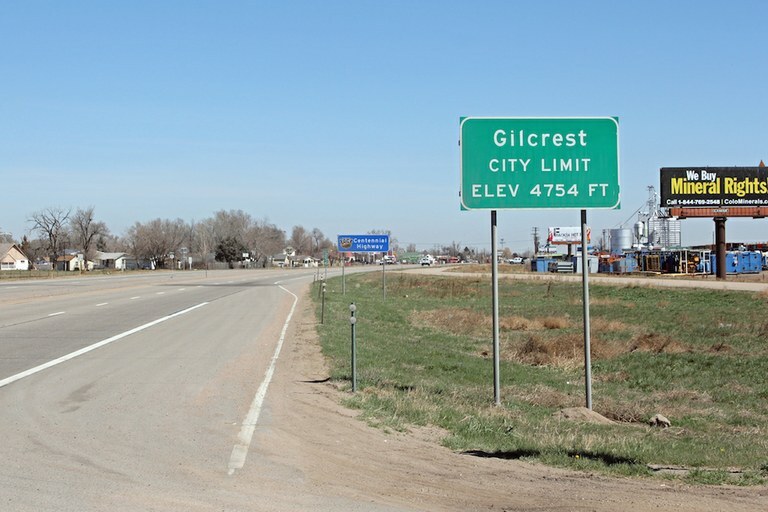 The small town of Gilcrest lies a few miles south from Fritzler’s home on U.S. 85. About 1,100 people live there. Some of the town’s residents commute to either Denver or nearby Greeley for work, and some find employment in the agricultural industry right in the area. It’s not a wealthy community— the town’s median income is about $42,000 a year. So it was a hard pill to swallow when the town had to spend a lot of money to deal with a problem they maintain they did not create: damage from high groundwater. Town administrator Trudy Peterson said they started noticing damage in 2010 when rising groundwater caused big bubbles to form in the liners of the water treatment ponds for the town. The liners eventually ripped and had to be replaced—to the the tune of $1.3 million. That money is in addition to what the town spent to replace old liners in 2007, which should have lasted 20 years. “We are just a tiny little town that’s trying to figure out ways to mitigate a really large problem that’s causing damage and a lot of expenditure that we would not need to be doing if the water levels had stayed at historic levels,” Peterson said. It is not easy to replace the liners, especially with the water continually rising. Peterson said that it has been a constant battle, like bailing water in a leaky boat, to remove the water or “dewater” the ponds to be able to replace the liners. And the damage isn’t just to the town’s water treatment facilities. Like Fritzler, residents of the town have had water damage in their basements and problems with their septic systems, not to mention damage to their foundations. Many in the Gilcrest area believe, and experts agree, that the water table has been rising in the last decade because farmers in the area have not been allowed to pump their water wells to the same extent they did for decades up until the early 2000s. Before that time, farmers pumped their wells and replaced what they took out through an informal process known as the “gentleman’s agreement” that even had the blessing of the state. But in 2002 there was a severe drought and court cases that led to new legislation that changed dramatically how agriculture in north central Colorado operated. Peterson said 1,800 wells in the area were decommissioned. To compound the problem, starting in 2006, those who did pump were required to replace the water they took out so that water users who may have a more senior right did not get injured by the well-pumping. Those more senior rights in this case are farmers down the South Platte near Sterling and then farther to the state line where the South Platte flows into Nebraska. This “augmentation” rule was in recognition of the fact that the river and the water underneath the river, called an alluvial aquifer, are connected. Developing and getting approval for a replacement or augmentation plan is expensive. Farmers must buy water from some other source to replace what they pump regardless of conditions such as how much water is in the aquifer, how much snow has fallen in the mountains, or how much storage is in reservoirs. All these data points are important, but not to Colorado’s water allocation system, which does not consider Mother Nature. With Front Range cities and towns buying up as much water as they can, it’s challenging for farmers to purchase what they need to replace what they would like to pump. In addition, getting a court decree for a replacement plan involves paying lawyers and water engineers. Those professionals work not only for the farmer trying to pump, but also for anyone up and down the river who may want to object to the farmer’s proposed replacement plan. Farmers and at least one water expert, Robert Longenbaugh, said that instead of going to trial and presenting evidence to a water judge, replacement plans are agreed to as a compromise, even if they may not be based upon the best engineering or science. The result is a water system that protects the rights of senior water users at the expense of other farmers who may be sitting on top of massive quantities of water. The South Platte River as it runs through Littleton, Colorado. The question of fairness, or who is responsible for the damage to people in Gilcrest, through no fault of their own, isn’t answered by water law. The legal system allocates the resource, but it doesn’t address problems like this one that it created. The state legislature recognized this dilemma about four years ago and turned to the Colorado Water Institute, at Colorado State University, to assess the issues and make recommendations. Translation: Old habits die hard, especially when you are talking about water in the West. While he was studying this issue, Waskom said it was so contentious that if asked to do it again, he would decline. Suggesting major changes to prior appropriation is the third rail of Colorado politics. That atmosphere made it difficult to do the study, and he felt that science should be able to operate without undue political pressure and with integrity, noting that the legitimacy of science is being tested. Except for some temporary suggestions, the recommendations in Waskom’s study were not pursued by the legislature. In the meantime, others have been trying to find a solution to the high groundwater. 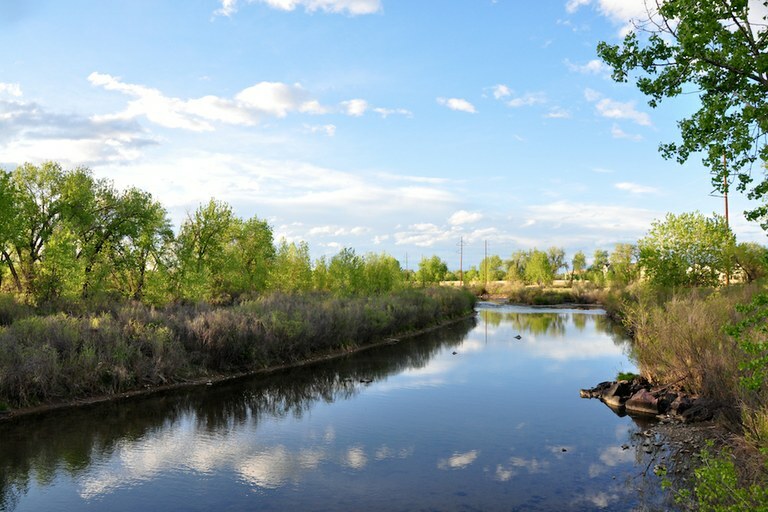 Members of the South Platte River Roundtable, the Colorado Water Conservation Board, and the State Engineer’s Office, along with farmers meet almost monthly to talk about possible solutions that do not involve a drastic change to the system. But even for these experts, solutions under current water law are difficult to find. If the state were to attempt to change the system so that the whole basin was managed more scientifically, as Waskom suggested in his report, that change would likely be challenged in court as running afoul of Colorado’s prior appropriation doctrine. Randy Ray is the director of the Central Colorado Water Conservancy District, located in Greeley. A big part of his job is to help find replacement water for about 600 to 700 farmers, so they can pump their wells to some extent. He is also one of the people who meets monthly to find solutions to the high groundwater that plagues Gilcrest. He knows the area well, having gone to high school in the small town. When asked if Colorado water law is flexible enough to deal with the high water he said, “I think the short answer is no, it’s not flexible enough.” And when asked how it could become more flexible, Ray hesitated and said he had a hard time answering that question. Ray and others sympathize with farmers and the residents of Gilcrest, who are suffering from too much water in a state known for its aridity. Waskom said that he doesn’t think the problem will be solved until someone brings a lawsuit trying to hold someone else responsible for the high water. But, of course, to do that would require money for lawyers and engineers, and the outcome would not be at all certain. Fritzler, the farmer near Gilcrest, thinks the clearest and most obvious solution to high groundwater levels would be to allow farmers to pump their water wells—even just a little to alleviate the high water. But he’s not optimistic that would happen. He still believes in the prior appropriation system, but he says something has to be done that changes the way the state administers water. If it doesn’t get solved, it could mean a blow to agriculture in the state and leave farmers under water—both physically and financially.